A woman with love is one of life’s diamonds. She is radiant. She is tough as nails but soft in the way she lights up the energy around her. She is the friend you can’t get enough of. The daughter you cherish. The mother that shaped you. She is the woman looking back at you in the mirror. She’s the unstoppable one. A woman with love knows how to pour her time and her passion into the things she cares deeply about, but never at the cost of the people so significant to her world. A woman with love knows how to wrap her arms around the family and friends that mean everything to her. She learned too how to wrap those same arms around herself, squeezing tight until she felt what everyone else believed…that she was worthy of such big love. A woman with love is intimate. With her focus on you, you feel like the only one in the room. Her energy comes around you, making you forget everything that happened before she was in your presence. Her love is your love. She leaves you feeling filled. Feeling inspired. Feeling whole. When a woman with love goes after something in this world, she does so with fierce focus. She understands her self worth, the confidence needed to achieve her dreams, but she understands self doubt as well. What makes a woman with love so strong, is her acceptance and comfort with weakness. She lets doubts pass, knowing staying there too long will take her down. She doesn’t try to be perfect but rather tries to be excellent. A woman with love achieves greatness in this world because she’s willing to feel the salt of pain, the string of regret, the heartbreak of failure and the depth of disappointment. Inspiration. Enlightenment. Joy. Support. A woman with love reflects all of your best qualities back to you. She shows your untapped gifts, because her love is the key to opening your heart’s door. She loves hard. She falls in love harder. She loves with every smile. With every wave. With every word. She falls in love any chance she gets. 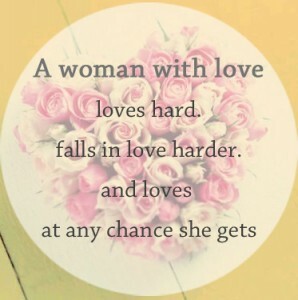 A woman with love is love. She is holding hands with the source. She is a guide of the great energy that will move mountains, heal hearts, change lives, realize dreams. A woman with love knows nothing gets in love’s way. Nothing escapes love. She knows love is her biggest secret, her greatest wand, her cherished gift. A woman with love is a soul made of one thing: pure love.